Until 2010, I used the same Singer Touch and Sew sewing machine since I received it as a high school graduation gift in (gulp!) 1974. I was seventeen when my parents presented me with this long-time companion, which was actually slightly used when I got it, and I was thrilled. Up until then, I had been sewing on an old off-brand machine that smelled like burning oil every time I used it. And yet, I sewed miles of seams on it. Other than making my bedroom smell like an auto repair shop, it was reliable. It got the job done. But this new beauty had lots of options. It came with a box of cams–little black hard plastic discs with patterned edges–which allowed me to choose all kinds of decorative and utilitarian stitches. I mostly switched between the zig zag disc and the one for a blind hem stitch. 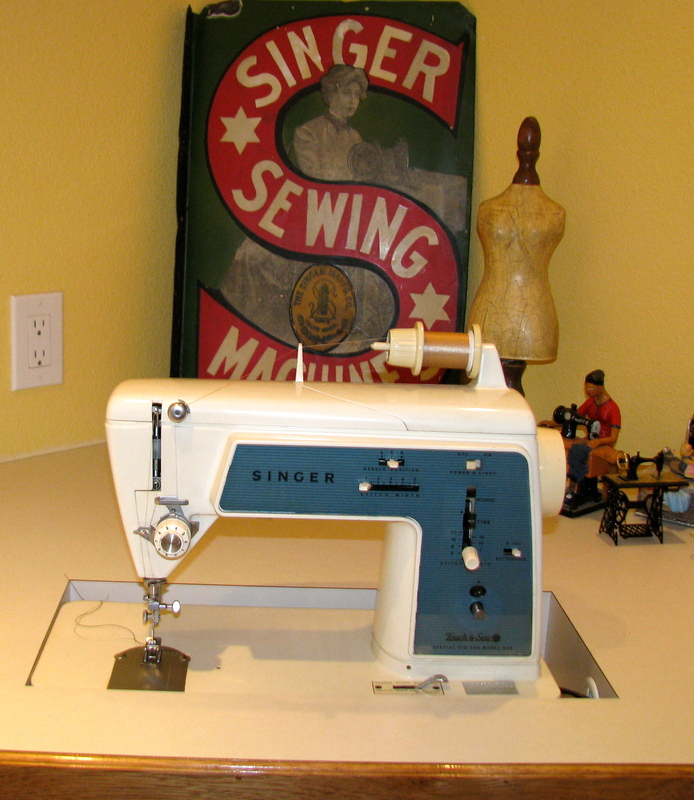 But the very best thing about this machine, and every other Touch and Sew, was that fabulous push-button bobbin. The little plastic bobbin with uneven sides didn’t hold much thread at the time, but that was of little consequence since rewinding was a breeze. Slide open the throat plate, push a button, wind the thread around the presser foot screw, and step on the pedal. You didn’t have to unthread the machine at all! I have really often wondered why that wonderful feature was not carried into other lines and brands of machines; that single feature is what kept me from moving to a more modern machine for years. A small crisis led to the purchase of a new machine. I was in the middle of a time-sensitive project, and the timing went out on my old Singer. (The plastic gears in all of the Touch and Sews have a limited lifespan!) I was hoping that it could be quickly repaired, but as I drove to my local sewing machine store, I knew better. I left my Singer for repair, and drove back home with a brand new basic Baby Lock named Grace. (Yep, that name is displayed right on the front; a nice reminder of what I need and what I should offer to everyone around me every time I sit down to sew!) I already had a Baby Lock serger, which I loved, so this sewing machine seemed a safe choice. I deliberately stayed away from the top-of-the-line machines, because I had done no research to find out what I really wanted. But for a little over $300, I acquired Grace, and she and I got along just fine. I finished my project in record time. After my Singer had been repaired, I set it up with the add-on buttonhole attachment, which is about as old the Touch and Sew itself. It has sized templates that drop in the back of the contraption for a perfect buttonhole. I love that thing so much that when I wore out my first one, I found another one on Ebay. I ordered it in the hopes that the previous owner had not racked up as many hours on it as I had on mine, and so far, so good. So now, when I need to make a set of buttonholes, I thread the right color on the Touch and Sew, and I’m ready to go. Old habits are hard to break!